On a cold morning, 15 of February, 1769, the Spanish ships San Antonio, San Carlos and San José set the command of lieutenant Pere Fages with a detachment of volunteers from Catalunya in tow, and headed for the unknown. Gaspar Portolá, captain of dragons, was leading another expedition land at the same time. Both would bring about the last epic Spanish colonial achievement, the conquest of upper California. Carlos the Third would entrust an important mission to those men, as well as to the viceroy of New Spain. Due to the rise of rebelliousness among the Jesuits, who were trying to accused of assasinate the King, the monarch ordered the founding of prisons and missions to the north of the royal path. The threat of assasination, the conspiracy, the terrible scurvy plague and the greedy search for gold in dangerous lands would speed up the events and turn the conquest into an unimaginable nightmare. Despite all this desolation, however, a beautiful and enigmatic love story emerged between captain Fages and an indigenous girl, Clara Luna. She would become his greatest ally and his enemy. Ramon Vilaró, traces his work from Francisco Javier fictionalized, the Comillas and Fray Junipero Serra. In the regnat king Carles III, the presence of catalans to America is going incrementant. 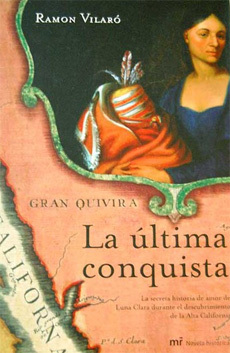 Ramon Vilaró explain the conquest of Alta California in this novel. The firts governors in California was the catalans. In 1769 began the last feat expansionist Spanish Empire: the conquest of Alta California, which unfolded under the express orders of Carlos III and it focuses the attention of the writer Ramon Vilaró, that under a living language, pleasant and excellent construction, manages to get into a world full of adventures and ambitious political projects that changed the course of history.